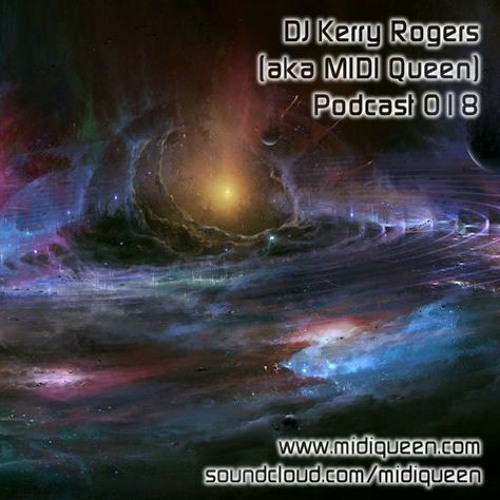 DJ Kerry Rogers (formerly MIDI Queen) from Dallas, Texas here. 2018 has been a rough year but I finally got to finish a new podcast episode right at the end of it! I hope you'll find this extra-long set was worth the wait. This episode features 15 progressive house and assorted genres of out-of-this-world tracks all available on Beatport. You can check out all my podcast episodes and other mix sets at www.midiqueen.com too. Thanks to all the artists and remixers featured here, and thank you so much for listening! Watch for more music in 2019! And as always I hope you enjoy the music... DJ Kerry Rogers Podcast 018 - 01:29:19 1. Tone Depth & Simply City - Polaris (Original Mix) - 00:00 2. Nhar - Blue Flame (Original Mix) - 7:17 3. Derek Howell - One Way (Rise and Fall Remix) - 13:00 4. 8Kays - Pluto (Original Mix) - 20:47 5. Quivver - 2 Shadows (Original Mix) - 25:26 6. Guy J - Algorithm (Original Mix) - 31:07 7. Jerome Isma-Ae & Alastor - Reflection (Extended Mix) - 37:18 8. Giom - Love/Hate (Original Mix) - 42:27 9. Bob the Groove - Sonic Cake (Original Mix) - 47:35 10. Fehrplay - Zeitgeist (Original Mix) - 52:43 11. Fat Sushi - Solaris (Original Mix) - 59:07 12. Space Motion & Siguiente Tecnologia - Giri (Jiminy Hop Remix) - 01:03:27 13. Kamilo Sanclemente - Alma (Original Mix) - 01:10:21 14. Sentre - Do It (Main Mix) - 01:16:43 15. Tim Robert - We're Good Together (Original Mix) - 01:23:35 And please visit my shiny homemade website at www.midiqueen.com too!